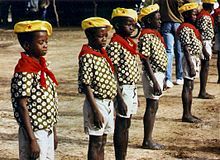 The history of Burkina Faso includes the history of various kingdoms within the country, such as the Mossi kingdoms, as well as the later French colonisation of the territory and its independence as the Republic of Upper Volta in 1960. Thomas Isidore Noël Sankara was a Burkinabé revolutionary and President of Burkina Faso from 1983 to 1987. A Marxist and pan-Africanist, he was viewed by supporters as a charismatic and iconic figure of revolution, and is sometimes referred to as "Africa's Che Guevara". Blaise Compaoré is a Burkinabé politician who was president of Burkina Faso from 1987 to 2014. He was a top associate of President Thomas Sankara during the 1980s, and in October 1987, he led a coup d'état during which Sankara was killed. Subsequently, he introduced a policy of "rectification", overturning the leftist and Third Worldist policies pursued by Sankara. He won elections in 1991, 1998, 2005, and 2010 in what were considered unfair circumstances. His attempt to amend the constitution to extend his 27-year term caused the 2014 Burkinabé uprising. On 31 October 2014, Compaoré resigned, whereupon he fled to the Ivory Coast. 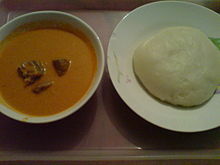 The culture of Burkina Faso in West Africa is also called the Burkinabé culture. Chantal Compaoré, born Chantal Terrasson de Fougères is the Franco-Ivorian wife of former President Blaise Compaoré of Burkina Faso. Born in the Ivory Coast, after becoming the First Lady in 1987 she spent much of her time on charity work in Burkina Faso. Her husband, who came to power in a bloody 1987 military coup, was overthrown in the 2014 Burkinabé uprising. 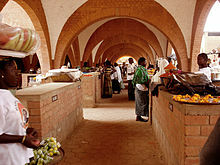 Chantal Compaoré was subsequently forced to flee to her home country, going into exile together with her husband. The Burkinabé uprising was a series of demonstrations and riots in Burkina Faso in October 2014 that quickly spread to multiple cities. They began in response to attempts at changing the constitution to allow President Blaise Compaoré to run again and extend his 27 years in office. Pressure for political change came from civil society and in particular from the country’s youth. 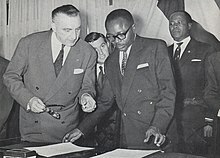 Following a tumultuous day on 30 October, which included the involvement of former Defence Minister Kouamé Lougué and the burning of the National Assembly and other government buildings as well as the ruling Congress for Democracy and Progress party's headquarters, Compaoré dissolved the government and declared a state of emergency before eventually fleeing to Côte d'Ivoire with the support of President Alassane Ouattara. 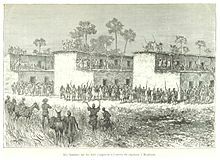 Burkina Faso–Taiwan relations referred to the historical relationship between the Republic of China (Taiwan) and Burkina Faso. Taiwan had an embassy in Ouagadougou, and Burkina Faso had an embassy in Taipei. The last ambassador of Burkina Faso to Taiwan, appointed in August 2017, was Aminata Sana Congo. 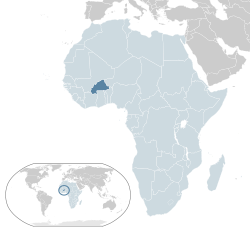 Burkina Faso–Libya relations refers to the current and historical relationship between State of Libya and the Republic of Burkina Faso. 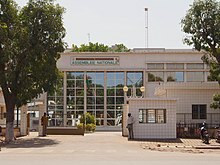 Libya maintains an embassy in the Burkinabé capital of Ouagadougou, and Burkina Faso one in the Libyan capital of Tripoli.